You are browsing the archive for Course Information. On Twitter and other social media, we, @A_L_T, use #altc as our main hashtag, so instead of following #ocTEL look out for tweets #altc to keep up to date with news, research and other developments. As well as continuing the conversation on social media, why not join ALT as a member, see https://www.alt.ac.uk/get-involved/membership for details. While ocTEL is winding down, preparations fo our annual conference, #altc, from 1-3 September at the University of Warwick, UK, are well underway. Early Bird registration is now open https://www.alt.ac.uk/civicrm/event/info?reset=1&id=93 . ocTEL is only one way in which we work to support professional development in Learning Technology. If you or a group of you want to gain professional recognition in Learning Technology, build on what you have done in ocTEL with our accreditation scheme, CMALT. See https://www.alt.ac.uk/get-involved/certified-membership for further information and how to register. You can also read and contribute to our newsletter http://newsletter.alt.ac.uk/ or watch or listen to ocTEL sessions or other videos on our YouTube channel https://www.youtube.com/user/ClipsFromALT . Completing the survey will also allow you to claim your final ocTEL Participant badge at http://go.alt.ac.uk/octel2104-gold-badge. To receive this badge enter the activity code included in the final course email or contained at the end of the ocTEL Experiences & Outcomes Questionnaire mentioned above. ocTEL 2014: What we built together – thank you! Week 6 is the last week of the formal running of the course and on 23 June is the officially the last day of the course. Before we get to the ins and outs, we want to acknowledge what our community of authors, tutors, presenters and participants have built together. 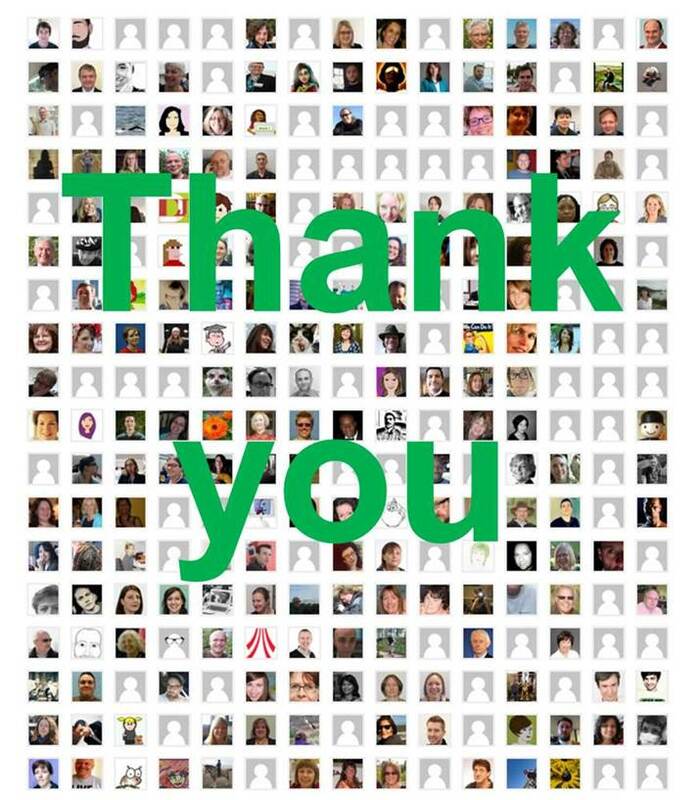 ocTEL 2014 has reached 1000+ people from 50 countries, contributing a total of 5,600+ tweets, 1,600+ badges, close to 1000 forum posts and hundreds of blog posts over 6 weeks. After the end of July and over the summer, we will archive the site, as we have done with ocTEL 2013, so that its content remains available, but you can no longer post to forums or groups. We will also publish the data from the course openly as before, so that you can use it for your research – similar to the way in which we have shared our platform developments openly. all the materials we’ve originated are available for re-use under a CC-BY licence, and we’re interested to hear how they can be made more useful for re-uses. Finally, if you have enjoyed participating in ocTEL you can claim your final ocTEL Participant badge at http://go.alt.ac.uk/octel2104-gold-badge. To receive this badge enter the activity code included in the final course email or contained at the end of the ocTEL Experiences & Outcomes Questionnaire mentioned above. Comments Off on ocTEL 2014: What we built together – thank you! 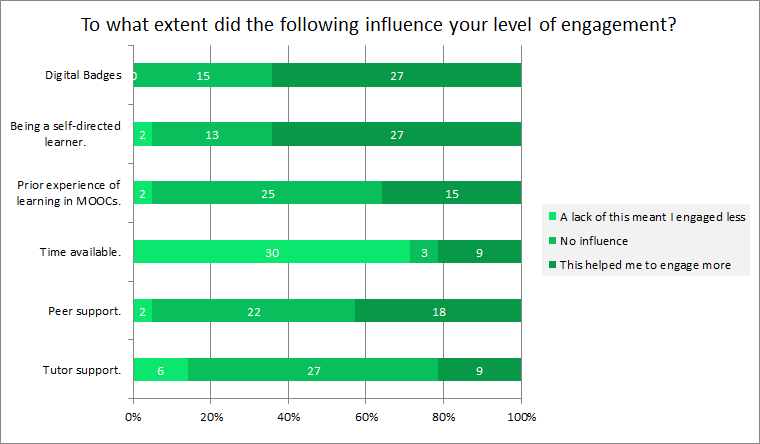 What influenced participants level of engagement in ocTEL? Evaluating ocTEL 2013 with this year: What do the numbers tell us? As we enter the final topic of ocTEL it’s perhaps not surprising that we, the ocTEL team, are also asking ourselves the question ‘Where do we go from here‘. Part of this answer is to look at where we have come from. Below is a graph I prepared recently comparing this year’s ocTEL with last year. It shows the number of ocTEL participants active in each week (active being classified as making at least one contribution to course reader or forum on ocTEL site). It’s interesting to see that compared to last year we had over 100 more active participants in the first week in 2014 than in the previous year (this is despite registrations being down from 1,400 to 1,000 – although the number of registrations is probably misleading). 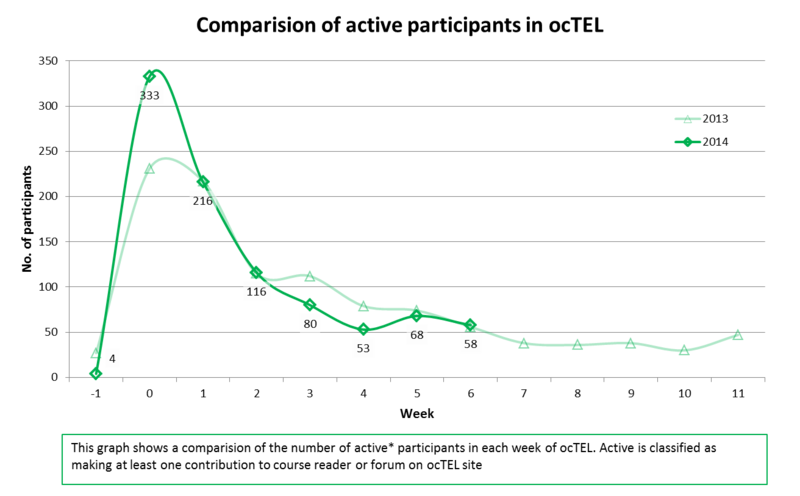 You could argue that this increased activity in the first week is in part due to how the course has been redesigned. In 2013 this week was a dedicated induction week for participants to find their feet. This year we combined induction with some course material and directed tasks. In the remaining weeks there has been a remarkable similarity in the number of active participants. There are some caveats when interpreting this graph. One important factor to bear in mind is that the data is based on activity collected on the ocTEL site. This includes activity such as blog posts and social network updates collected in the Course Reader. Given the vagaries of this type of data collection including matching the author profiles to different sites as well changes in the way we collect this data the numbers should be interpreted as an indication rather than a statement of fact. Hopefully you are encountering similar questions as you consider the evaluation of your own TEL projects. Thanks to our speakers and lead tutors as well as everyone who could attend our week 5 webinar on ‘Learners as leaders’. Links to the recordings have been added to the week 5 course material and included at the end of this post (if you’ve missed any of the other webinars links are included in the the course material page). As part of the session Ellie Russell (NUS) highlighted the challenges and opportunities of engaging students in all aspects of education, describing it as “simultaneously exciting and difficult” . In the second half Shân Wareing (Bucks New University) explored how different approaches leadership can be used to support change within institutions. As someone who has a small role in tutoring on the course and with a CMALT portfolio in the drafting stages, this blog post is about sharing my personal reflections on how one might use experience of leadership and management to help gain CMALT. If you want to find out more, visit the CMALT ocTEL group or refer to the CMALT pages on ALT’s website. Answers to most frequently asked questions will probably be covered in the Guidelines for CMALT Candidates and Assessors. In previous blog posts in this series, we have covered all sections of the portfolio, including Operational Issues, Learning, teaching and assessment, the wider context and Communication. So this week, I want to reflect on how having experience of leadership in different forms can provide a useful starting point for defining a specialist area, at least one of which every portfolio needs to include. One way to think about this is to concentrate on people. The way in which human beings and technology interact, particularly in learning, teaching and assessment, is complex. Our relationships with people are similarly often mediated by technology and using tools effectively to create productive working or teaching relationships is always a challenge. If I was going to write about leading people, this is where I would start. I would ask, what do I use technology for in this context? How can I give examples of this? Does is work? How could I improve? What are the limitations? Audio snapshots of “Hello, can anyone hear me?” would certainly feature in this section for me. As Julie and Brian, the lead tutors for this week’s topic, mentioned in their introduction, projects involving Learning Technology can easily get off track, become expensive or otherwise change direction. My experience is that the more distributed a project team, the more technology plays a part in making things work – the harder it can be to get things done (let alone on budget and on time). While I realise there are accomplished ambassadors of intelligent project management software I am not one of them. So if project management or leadership in delivering or steering projects would be my focus I would personally write about how getting people motivated, tools to work and deadlines not to slide… with a lot of reflection on the kinds of tools I found work in different contexts. A final example, leading innovation, for me is all about the concept of getting decision makers involved and understanding how innovation using Learning Technology works and why teachers, learners or technologist want to do something. I have had so many experiences of change happening, a technology or gadget getting adopted because someone tried it out first hand – got a personal experience of the potential of a new technology. These moments, when you see someone discovering for themselves how exciting [insert a more appropriate term as needed] something is or could be – these moments can shape the way of things to come. Taking risks, and innovation always involves risk, is much easier when those who manage the risk can understand why they are doing so – what the potential they are supporting or promoting is. Whatever your specialist area, whatever your experience the key point is that the process of drafting your CMALT portfolio will encourage you to reflect on what you do as a leader and on your own learning. I hope that for the remainder of this week #ocTEL across the forums, your own platforms and at this week’s webinar on Thursday at 12.30 (BST) you will find your inspiration for adding to your own CMALT portfolio in the making. The Backpack is the core management tool for storing badge data and setting share controls. Earners’ personal Backpacks are accessible only to them, though they can share collections of badges as they see fit. You can create your own Mozilla Backpack here. The Mozilla Backpack is a place where you can collect your badges you’ve earned from different course, organisations or anywhere else issuing open badges. Once you have the badges in the Mozilla Backpack there are a growing number of tools and sites to help you display your selected badges. So if you have earned some badges as part of ocTEL you can now send them to your Mozilla Backpack from the Open Badges Issuer page. I won’t go into details in this post but to achieve this we’ve written a custom plugin. Consequently ocTEL participants will be the first people in the world – to our knowledge anyway – to have Open Badges issued directly from the existing BadgeOS plugin powering the site. This also means if it doesn’t work for you your feedback is invaluable. To help with sending your ocTEL badges to your Mozilla Backpack our tutors, led by Rose Heaney, have prepared this guide, which as a Google Doc you can comment on. Welcome to the penultimate week of ocTEL where we’ll be looking at the role of leadership, management and how to keep on track. This week will focus on the importance of planning the implementation of your TEL project, in particular identifying key successes and failures and understanding how to manage risks. In the context of this module, a project could be the implementation of an online course, or an institution-wide review, or a rollout of a new TEL system. As a TEL explorer you will consider the role of key stakeholders such as students and senior management, the importance of institutional support and the advantages and disadvantages of institutional versus externally-sourced solutions. This week’s webinar will take place on Thursday (12th June) at 12:30pm and will consider the views of two key stakeholders in TEL projects. We are delighted to have as our speakers Ellie Russell, Quality and Student Engagement Consultant, from the National Union of Students and Prof. Shan Wareing, Pro Vice Chancellor Learning and Teaching, from Bucks New University. Your lead tutors for this week are Julie Voce, E-learning Services Manager at Imperial College London and Brian Boullier, Group IT Director at Bradford College. As in previous weeks, we will be supported by the excellent ocTEL support tutors and the ALT team. We are looking forward to hearing your thoughts and experiences via your blogs, tweets or the course discussion forums. Here are this week’s course material and activities. Enjoy the week!